Reviews of the Ivy Bridge platform at AnandTech have focused solely on the primary chipset supplied to most desktop users – Z77. In a twist, today we are reviewing both the H77 platform, but also a mITX product in the form of the Gigabyte H77N-WiFi. Gigabyte has released two mITX motherboards for use with Ivy Bridge processors – both the H77 and Z77 variants, and they see the H77 as the one to focus on. This makes sense as mITX builds are not often overclocked, and are limited to a single PCIe slot, making two of the main benefits of Z77 void and pointing to H77 as the answer. In a twist to previous 7-series reviews, we are going to focus our attention with mITX boards towards the i3-3225 processor. This is a dual core Ivy Bridge processor with both HyperThreading and Intel’s HD 4000 (the high end) integrated graphics, all within a 65W rated envelope. The direct competition to this lies at the hands of the Trinity A10-5800K, which we have reviewed in terms of pure performance and from a chipset point of view. Measuring only 17cm x 17cm (6.7” x 6.7”), a mini-ITX motherboard has to work with very little PCB real estate. On high end motherboards, we often see that the addition of extra controllers and buttons can take up a lot of room – thus for a mITX product, we have to strip away all the excess, see what we are left with, and then add in features as appropriate. For the large part, or H77 platform acts similar to the Z77. Our main differences with H77 are the lack of overclocking, the restriction of memory straps to DDR3-1600, and PCIe devices from the CPU are limited to a single x16 slot. Thus on a large mATX or ATX H77 product, extra slots for PCIe devices will most likely be taken up by x1 or x4 slots linked to the chipset, or PCI slots by PCIe-to-PCI conversion. H77 still gives us access to four USB 3.0 ports, two SATA 6 Gbps, four SATA 3 Gbps and video outputs. From the perspective of small form factor systems the usual suspects for a product like this are in small 24/7 builds, HTPC, or a mobile gaming machine that can be easily carried. From the point of view of Gigabyte, this means that a H77 product makes sense, but a Z77 product should be available to users if so desired for overclocking. It should be noted that the H77 products should be able to be underclocked if required, though not always undervolted. On the whole, the Gigabyte GA-H77N-WiFi is a nice build, although it contains a mixture of good and bad design choices. Due to the use of H77, there is no need for any substantial power management, so none is given – the board still uses Ultra Durable 4, but we have a 3+1 system with no heatsink. The main critical point with this board though (as will be the main critical point of many mITX builds) is the placement of the processor in relation to the memory and PCIe slot. The socket area is up against the memory and the PCIe slot, meaning that users have a limited range of coolers to use. As shown later in the review, large coolers will have to be oriented correctly, with different memory choices, or disregarded altogether. If the cooler is large, then there is also intrusion onto the PCIe slot if the GPU has a rear back plate. This is not ideal. There are mITX boards were the socket is in a more amenable orientation, but yet it is placed in such a location that only stock coolers or all-in-one liquid cooling systems are to be suggested. With the popularity of ‘tall’ mITX cases such as the Bitfenix Prodigy, large coolers may have to find their way onto these smaller systems in due course. Maybe I am just being picky – this H77 board is not designed for overclocking, and thus big coolers are not necessarily needed. After some intense discussion with Gigabyte regarding this product, it comes to light that the H77 and Z77 mITX boards that are on sale to consumers are actually models designed for a specific customer in Asia. Gigabyte do this on a regular basis – if a particular business customer (e.g. a distributor, system builder) wants a specific design and is willing to place a large order, then Gigabyte will go that mile to make the product. Sometimes these products are then also marketed to home users, such as the H77 and Z77 mITX. This is in important point, given that we have baffling placement locations on the H77N-WiFi. We have SATA ports at the top end of the motherboard, along with the front panel header and a USB 3.0 header right up against the IO panel. The 4-pin CPU power connector is located so far into the board that it raises concern about how Gigabyte would assume that the board would be placed in a case with respect to the front panel and power supply. The board offers several plus points, especially with the fact that the board is kitting out with dual HDMI ports. This allows for the division of labor between video output on one and audio output on the other (for home audio systems), or both outputs on both for multi-monitor setups. (Contrary to what was my belief, the Z77 / Ivy Bridge specifications do not dictate which digital outputs need to be present, only that there are three to use – meaning that on full size Z77 ATX boards, manufacturers could use dual HDMI ports there instead of DVI-D.) There are also dual Realtek network ports for home server/SOHO setups, alongside an Intel WiFi module capable of connecting to WiDi displays for cable-less management. Performance wise, our only comparison point lies with an equivalent Trinity based platform. In this circumstance, the i3-3225 trades blows with the A10-5800K, but both sides put up crushing blows against the other. On the Intel side, we have superior single threaded performance, especially in FP benchmarks where the difference can be 43% higher on the Intel. This also brings the results using a discrete graphics card in favor for the Intel. In comparison, the Trinity platform goes toe-to-toe with Intel on multithreaded INT benchmarks, and scores a win when comparing IGP performance. Even though this product initially being produced for a sole customer with specific needs, it does offer a price-competitive take on the mITX 7-series design. As the H77N-WiFi is a mini-ITX board, we have the standard mITX dimensions with the PCB – 17cm x 17cm. In total the motherboard offers two full length DDR3 DIMM slots, a total of four SATA ports, two fan headers, one USB 3.0 header, one USB 2.0 header, dual Ethernet ports, an integrated Intel WiFi module with WiDi support, dual HDMI input with DVI-I and a single PCIe 3.0 x16 slot. The socket area is, for lack of a better word, confusingly placed. We find it on the bottom right of the image above, and looking closer at the picture we see the four socket holes are enclosed in a white square on the PCB. This is the Intel minimum specification for the 1155 socket platform – all items in this space has a maximum z-dimension in order to allow the Intel air cooler to function appropriately. Motherboard manufacturers all adhere to this and anything extra beyond this space is at the discretion of the manufacturer. Typically on larger boards manufacturers will give more space, as users may want to large air coolers in order to improve overclocking or thermal performance within the case. Admittedly on a mITX board there is not much extra room to give, but Gigabyte have placed two of the edges up against two main components of the system – the memory and the PCIe slot. The motherboard is marketed as an all-round performer, meaning in some builds (especially with cases like the Bitfenix Prodigy) users will put in a large GPU combined with tall memory. It has been reported that the close proximity of the socket area to the GPU will cause problems with GPUs that have large backplates, and essentially Gigabyte have limited users to the stock air cooler or similar designs that do not breach the x-y component of the socket area, such as all-in-one liquid coolers. I should stress that this is a common problem on *most* H77/Z77 mITX boards, and not just on this one. The alternative would be to arrange the socket and chipset layout as with normal ATX boards – with the socket at the top and the chipset/SATA ports at the bottom. I would have suggested a couple of extra design features in order to ease the burden. The WiFi module could be moved to the underside of the board, or replacing the memory slots with SO-DIMM modules. Even the SO-DIMM could be moved to the underside and slanted, similar to laptops and notebooks. This would leave more space on top to play with SATA ports to give the full complement, headers or the like. One of the downsides from a construction point of view may be complexity, or having to add more PCB layers, which in turn adds cost. Aside from the socket area, I should point out the fan headers. With the Gigabyte H77N-WiFi, we have two – both to the left of the socket, both 4-pin. One is next to the onboard audio header, and the other is next to the 4-pin CPU power connector. The location of this 4-pin CPU power connector is a little odd. While I accept that it must be near the CPU itself, being in the middle of the board means that a PSU cable has to stretch over a good number of components. This restricts airflow and reduces aesthetic appeal (if desired). If the CPU and the chipset were swapped around, this would be less of an issue perhaps. Along the top of the board we have our SATA ports. The H77 chipset offers the same amount as the Z77, this being two SATA 6 Gbps and four SATA 3 Gbps. Nevertheless, due to real estate concerns, we lose two of the SATA 3 Gbps ports on the Gigabyte H77N-WiFi. To the left of these is the solitary USB 3.0 port, powered by the chipset. The chipset itself is hidden behind a small heatsink. Moving right we have the front panel header and a USB 2.0 header. The Intel WiFi module is located flat against the motherboard, with the two cables connecting the module to the antenna snaking under the chipset heatsink. Besides the 24-pin ATX connector we have the motherboard battery. This is flat against the PCB like in ATX models, rather than upright which is what we normally see on PCB limited designs. The rear panel on the Gigabyte H77N-WiFi is one thing done right. From left to right we have a combination PS/2 port, two USB 3.0 in blue (chipset), dual HDMI, two antenna ports, DVI-I, two gigabit Ethernet ports (Realtek), four USB 2.0 ports, optical S/PDIF output and audio jacks (Realtek ALC892). It should be noted that Gigabyte use their one-fuse-per-USB port system, meaning that should one USB port fail then the rest of the USB in the block are not affected. Asides from the layout choices which could be questionable, we could also argue if there is additional merit of including two Ethernet ports as well an Intel WiFi module. A lot depends on the layout of your system – home network and NAS via Ethernet, but also connected to the home network via WiFi is one orientation. As I have explained, the Gigabyte H77N-WiFi is price competitive compared to Z77 ATX boards. Part of this comes down to using Realtek network controllers rather than Intel (even if we do have an Intel WiFi module), and the less than optimal ALC892 codec. If this does not bother the user, then as long as putting the system goes well, then the Gigabyte can offer a nice ‘bang-for-buck’ product. The ASRock Z77E-ITX also has mSATA. 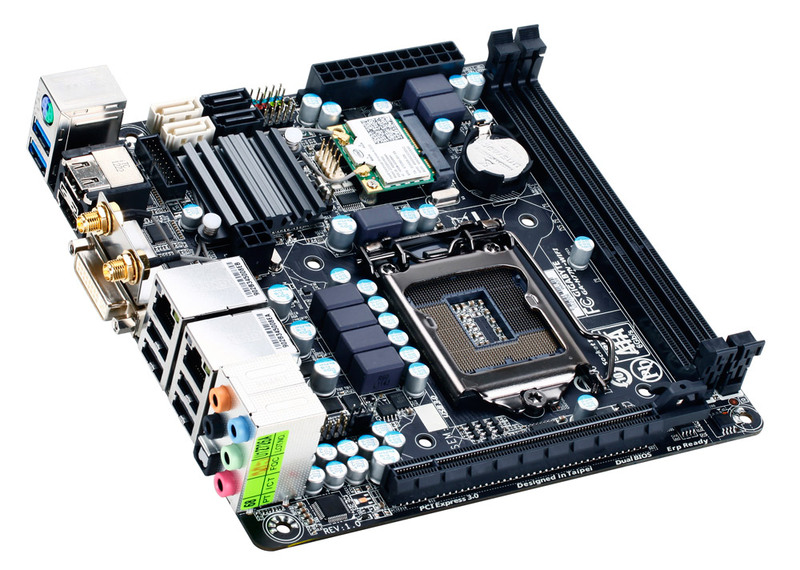 I have the ASrock z77 E-ITX which is a lovely mini itx board and has a MSata on the back. Admittedly only SATA2 (like all MSata sockets at moment). Go for the samsung green low profile memory (fantastic overclocking potential) and there is no need to worry about CPU coolers interfering with memory heat spreaders. 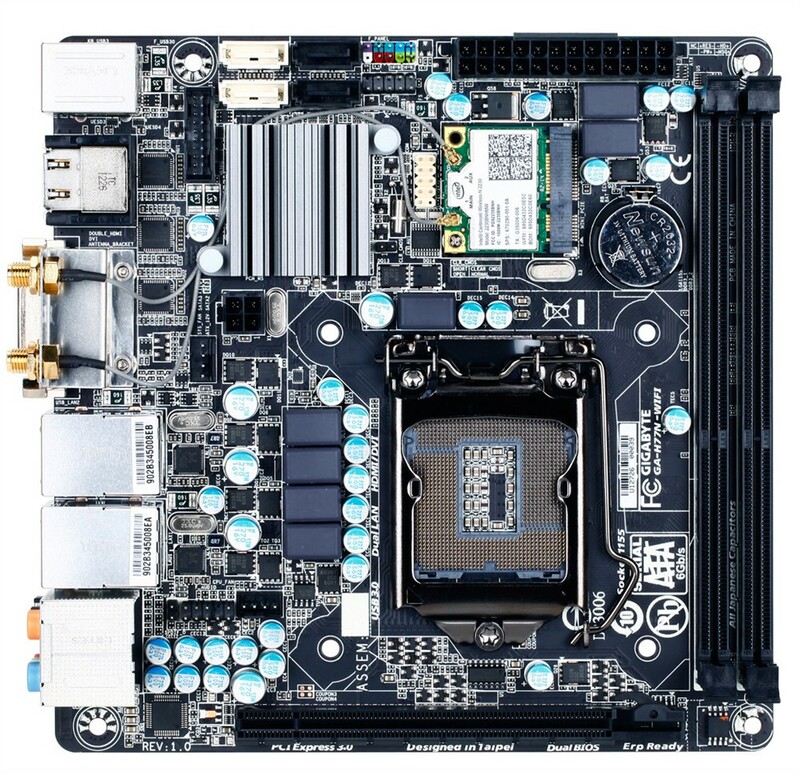 What I would really like is for MB makers to put the ATX socket at right angles to the board, it would make cable management much easier, and that is always a problem in Mini ITX cases. there are 3 itx mobos and I own 2 of them I have the truly great ASrockz77 E-ITX with a msata under the board I have a crucial 256gb in it. 1 x PCI Express Full-/Half-Mini Card slot with support for mSATA . my build has a crucial msata in it also the 256gb size. looking at this board you may be able to run a msata instead of the wifi. I have the asus H77 ITX, with 3770 + 2 x 2.5" SSDs + 2 x 3.5" Velociraptors with icepack. all inside a antec ISK 65, which is powered with 150W dell power brick to get around the 65 limit. I did have to modify the ISK removable frame brace to mount the 2 x 3.5" velociraptors, but there is enough airflow with 2 x 80mm + some clever ducting using a thin piece of flexible plastic to keep everything cool under load (prime + crystal diskmark): 85 C CPU & 45 C on raptors. where is the challange on building mini HTPC with mSATA hehehe =P.